Emory Moot Court Society is a competitive, student-run organization that provides experiential opportunities to develop oral advocacy and brief-writing skills. Emory Law students organize and host the annual Civil Rights and Liberties Moot Court Competition, held at Emory Law in the fall semester. This year's competition will be held on October 18-20, 2019. Membership in Emory Moot Court Society is open to all full-time students, properly enrolled in Emory Law with a minimum cumulative grade point average of 2.35 and who satisfy the requirements of the membership listed below. Students enrolled in any joint JD degree program may be eligible for membership, provided that all other eligibility requirements are met. First-year students participate in the Stange 1L Competition each spring for the opportunity to gain membership in the society. Moot Court Society is comprised of 2L, 3L, and AJD members. All members must successfully compete in one intraschool competition and one interschool competition. On the basis of their brief-writing and oral advocacy scores in an intraschool competition, competitors will be placed on one of our competition teams, which travel to and compete in various interschool moot court competitions around the country. Faculty policy states other students and student organizations may not use the Emory name in connection with a publication or interschool competition team without the consent of the Dean's office. Emory Law maintains an active interest in any function held on or off campus in which the name of Emory University School of Law is used. Seigenthaler-Sutherland Cup National First Amendment Competition in Washington, D.C. In addition, Emory sends a team to compete in the National Moot Court Competition every year. 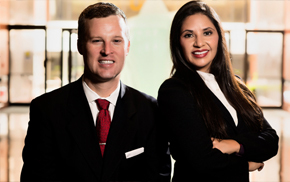 Paola Arzu Stange 01C 05L and her husband Kirk C. Stange, founders of Stange Law Firm, have established the Stange Law Firm Scholarship to honor top participants in Emory Law’s moot court program. The scholarship is awarded to the overall moot court winner of the Emory moot court society 1L competition, based on the highest average score, written and oral scores weighing equally. Paola was a member of the Moot Court Society during her time at Emory Law, and says that experience gave her confidence as a practicing lawyer in the courtroom. Kirk has served as a moot court judge, taught CLEs, and served as a speaker at various engagements. The Stanges value proficiency in writing and orating, and their practice mirrors those values. The 13th Annual Emory University School of Law Civil Rights and Liberties Moot Court Competition will be on October 18-20, 2019. For more information, contact the Moot Court Society.